Elkan received his Ph.D. in microbiology from Virginia Tech and joined the NC State University faculty in 1958. Over his nearly 40-year career he taught more than 3,000 students, directed 30 master’s degree students and 28 doctoral students, and published 125 refereed articles and 3 monographs. For his exemplary service and scholarship, Elkan was awarded the Alexander Q. Holladay Medal for Excellence in 1996—the highest award presented by NC State for faculty achievement. Though he “retired” from NC State in 1994, Elkan has remained extremely active in the areas of teaching, research, and mentoring. Elkan became involved with the Park Scholarships program in 1997, when he was invited to serve on the program’s Faculty Advisory Committee. He’s quick to note that, in this and other capacities, he interviewed many Park Scholarships staff members who were hired over the years, including all of the current team. 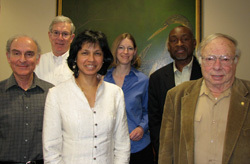 In addition to serving as a Park Faculty Scholar for a record four classes (the Classes of 2002, 2006, 2009, and 2011), Elkan led a number of co-curricular international excursions for Park Scholars. “We went to Egypt three times. Greece and Turkey, Spain, and Italy. Those were two-week trips, and we just toured,” Elkan said. On February 23, 2013, the Park Alumni Society awarded Elkan a well-deserved Honorary Park Scholarships Alumni Award for his many years of service to the program. His service continues today. As chair of the Park Enrichment Grant Committee, he remains committed to providing Park Scholars grant-writing feedback and funding for high-impact experiences such as study abroad, research, presentations at professional conferences, and a host of other beyond-the-classroom endeavors. 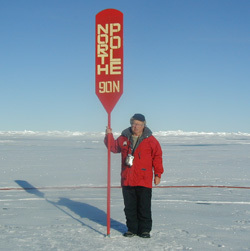 In 2001, Dr. Gerald Elkan traveled to the North Pole on a Russian nuclear icebreaker ship leased to New York’s Museum of Natural History. Elkan’s emphasis on personal and professional enrichment is a reflection of his own life experience. He was appointed by former North Carolina Governor Bob Scott to the state’s Water Resources Commission. For nearly a decade, Elkan has also served on the Bilateral Commission for the Moldova-North Carolina Partnership, housed within the Department of the Secretary of State. As part of this initiative, Elkan has traveled to Moldova five times, making it one of 40+ countries he’s visited. He has managed research projects—some of his own, including two funded by Fulbright awards, and some for USAID—in Africa, Eurasia, and South America. Each of the past 12 years, Elkan has traveled to Alaska not for research but as a passionate fan of the Iditarod Trail Sled Dog Race. He became hooked on the race when he met four-time Iditarod winner Susan Butcher, who invited him to her house on the Yukon River near Fairbanks. Elkan was impressed with Butcher’s ability to control 50 dogs using voice commands. “Her dogs were absolutely devoted to her,” he said. 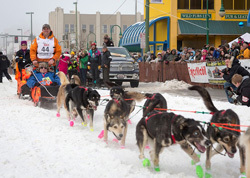 Elkan has ridden as a sled passenger—and has even done a bit of mushing himself—on a ceremonial run out of Anchorage that takes place the day before the Iditarod. During his time in Alaska last year, he visited all of the checkpoints over the race’s 1,000-mile route, a feat which required transportation by bush plane, ski plane, snowmobile, and helicopter over a span of 10 days. Never content to rest on his laurels, Elkan has recently taken on a new initiative. At his suggestion, the Gerald H. Elkan Distinguished Lecture on Science & Society, formerly housed within the College of Agriculture and Life Sciences, made its new home with the Park Scholarships program. Established by Elkan’s past students, associates, and friends in his honor, this lectureship supports an annual talk at NC State by a prominent thought leader. The Park Class of 2019 Distinguished Speakers Committee is working closely with Elkan and his associates to bring its first Elkan Lecturer to campus in Spring 2017. Stay tuned for details!